James O. “Jim” Sweeney, 59, died suddenly on Monday March 25, 2019 at Mercy Iowa City. Visitation will be held Sunday from 2:00 to 6:00 pm at Lensing Funeral & Cremation Service in Iowa City. A parish wake service will be held at 6:00 pm at the funeral home. Mass of Christian Burial will begin at 10:00 am Monday at St. Mary’s Catholic Church in Iowa City. Burial is planned for 2:00 pm Monday in the Cass Township Cemetery in Strawberry Point, Iowa. In lieu of flowers, Jim requested that memorials be directed to the Regina Foundation. Jim was born February 14, 1960 in Iowa City, the son of Joseph & Beatrice (Driscoll) Sweeney. Jim graduated in the Regina High School class of 1978 and attended the University of Iowa. Jim married Sue Munter August 29, 1992 in Iowa City. 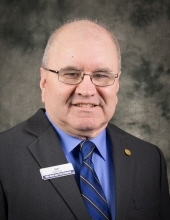 Jim has worked for Hills Bank & Trust Company since August 29, 1983. Survivors include Jim’s daughter Becky Sweeney of California; brother, Joe Sweeney (Margie) of Colorado and sister, Donna Kelley of Iowa City; sisters in law, Mary Jane Sweeney of North Liberty, Kathy Munter of Arizona and Nancy Munter (Todd) of Wisconsin; brothers in law, Ron Munter (Melanie) of California and Jack Munter of Colorado and several nieces, nephews. cousins and friends that he cared for very much. Jim was preceded in death by his parents, his wife Sue, a brother Dan Sweeney, sisters, Mary Ann Sweeney and Sharon Sweeney, his mother and father in law and a brother in law, Ed Kelley. "Email Address" would like to share the life celebration of James "'Jim" Sweeney. Click on the "link" to go to share a favorite memory or leave a condolence message for the family.